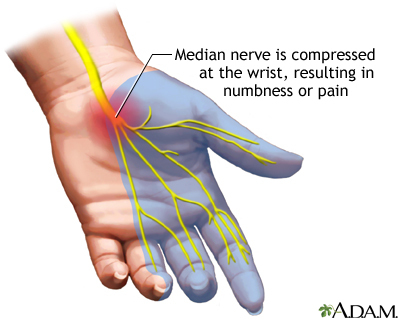 · Carpal tunnel is a median mononeuropathy with impingement at the level of the carpal tunnel. · Certain conditions such as diabetes, hypothyroidism and pregnancy are associated with carpal tunnel syndrome. o Most common are sensory symptoms such pain, burning, paresthesias, and numbness. o Motor symptoms are less common, and affect the median intrinsics, weakening thumb opposition and abduction. o Sometimes patients may have poorly localized symptoms extending to the forearm or arm. o Exacerbation of symptoms often occurs at night, with hand-shaking, with driving and with repetitive activities such as typing or knitting. o Volar splints (especially used at nighttime) and regularly scheduled NSAIDs are often attempted first for a period of 4-6 weeks in patients. o If symptoms fail to improve then consulting a hand surgeon for corticosteroid injections, nerve conduction studies and operative carpal tunnel release is recommended.